The Sunny Armenia. This is the way most travelers see this small but very hospitable country in the Caucasus. But not only in summer and spring you can relax. Winter in Armenia is able to give every tourist at least, and perhaps even more vivid emotions. If unrestrained want sparkling white snow, pure mountain air and positive communication — it’s time to visit Tsakhkadzor. He is one of the best ski resorts in the world. And fascinating tours in Tsakhkadzor will allow you to combine active leisure with sightseeing. The infrastructure of the courses corresponds to the best European ski resorts. All customers can request a car with driver from the airport or Yerevan, putting what model of vehicles they want to use — Opel Zafira or Mazda MPV 7 seats, Mercedes Sprinter, Lexus RX300 for fans of prestigious cars. Back car with driver in Tsaghkadzortransfer from Tsaghkadzor is at any time of the day and with maximum comfort for travelers. All vehicles are equipped with fittings for transportation equipment. Tsaghkadzor is deservedly so popular among tourists who prefer active winter holiday. Their services are given a 12 km high class tracks of different difficulty levels. To conquer the mountain peaks of Armenia will be interesting and absolutely safe for both experienced and novice athletes. An experienced private guide in Tsaghkadzor – man, able to open to tourists a completely different Armenia. Any guide will not be able to accommodate all of the attractions of this amazing country. Every settlement of Armenia – history, legend, tradition, heady aroma of wine and freshly baked bread. Tourists just need to rent a car in Tsaghkadzor and to choose the direction of the path. Where to go? The choice is not fundamental, each direction in their own way interesting. Garni pagan temple, winery in Areni, the ancient city of Khndzoresk – the attractions are endless. If skiing had just a couple of days, you can order a taxi in Tsaghkadzor and go to lake Sevan. The road to it lies past the tree of desires, which is over a thousand years. What to think? To return to Armenia again in the winter, summer, spring – this country at any time of the year welcoming. You will not forget rest in Tsaghkadzor ski. In Tsaghkadzor, located 70 km North-East from Yerevan Zvartnots airport (web site), faster and more comfortable taxi or minivan. This option is particularly suitable for those traveling to the resort with its own ski gear. A taxi from the airport to Tsakhkadzor costs 15000 AMD, van-7 seats — 28000 AMD, journey time — 1 hour and 15 minutes. Prices on page are in November 2016. Less costly option is to leave the airport by bus or taxi to the center of Yerevan (250 AMD), and from there by bus No. 14, 46, or 259 to get to known each Yerevan resident, visiting «the District» on the Avenue Indian organic shop address: (100 AMD). Here 5-6 times in day travel Shuttle bus in Tsaghkadzor, in the road — 1 hour 10 minutes, ticket price is 1500 AMD. From this stop every hour Shuttle bus to Hrazdan, the district center and 5 km from Tsaghkadzor. From the Terminus in Hrazdan to the resort you can walk or take a taxi ( 1500 AMD). The most budget way is to use long-distance buses, Yerevan—Moscow, Yerevan—Krasnodar and Yerevan—Ufa. They depart from the bus station in Yerevan and in Hrazdan (ticket price — 720 AMD). Then walk or take a taxi. Surrounded by a forest resort Tsakhkadzor is a compact residential area on the East and stretching up the slope of Teghenis mountain ski area in the West. Residential area, lying at an altitude of 1800 m, is small — only a few tens of two-storey houses with a few splashes of high-rise buildings on the perimeter. Hotels and guesthouses located here literally door to door. Here are most of the restaurants and shops, as well as the city’s main attractions. The ski area starts 2 km to the West of the residential area of Tsaghkadzor. Its borders mark the two lower cable car station and the complex of buildings of Ski centre with the rescue service, rental of sports equipment and a medical station. The main method of movement in a tiny Tsaghkadzor, just on foot. Transportation the resort provides a Shuttle bus to Yerevan ( 1500 AMD) and taxi. Taxi fare to the city: planting 400 AMD plus 200 AMD per km. The price of long distance is negotiable. For example, a trip to lake Sevan and back with a two hour wait from 8000 AMD. In the summer season many of the hotels in Tsaghkadzor offer lovers of outdoor activities Bicycle rental. The rent 5000-7000 AMD per day depending on the kind of bike. The local office of the company ATV Extreme snow Armenia conquerors of virgin lands and off-road can rent a snowmobile or ATV — from 5000 AMD for a small walk or 20 000-30 000 AMD per day. The leading operators — VivaCell, ArmenTel and «Ucom Armenia» — offer for tourists tariffs for mobile communications and online services to significantly reduce roaming costs. The line of prepaid tariff plans of VivaCell — Viva 2500/3500/5500/7500 cost from 2500 to 7500 AMD includes from 50 to 350 minutes of free calls to Russia (when connected to the «distant call» service) and from 2 to 10 GB of mobile Internet per month. To buy a SIM card at the offices of the operators, and almost in any kiosk or shop (passport required). There you can buy a universal card for depositing with denomination of 1000, 2500 and 5000 AMD. Almost all the hotels, guest houses and apartments of Tsaghkadzor, the hotel offers free Wi-Fi. Wireless Internet access is available in many restaurants and cafes, as well as in the Main sports complex of Tsaghkadzor and even on the ski slopes. The ski season in Tsakhkadzor lasts from December to late March. 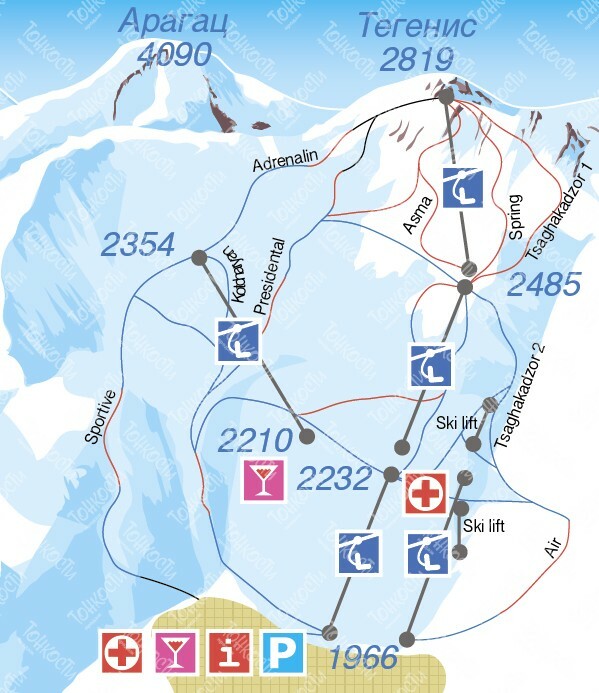 The ski area is located between 1966 and altitude 2819 m and includes 15 tracks of various degrees of complexity. Their total length is 30 km, the longest stretches almost 8 km On the top of black and red slopes for experienced skiers and snowboarders and virgin for freeriders. In the middle part of the slope is the blue track, green is for beginners. Serpentine with steep and sharp turns on the lower section to the North of the lifts — only for experienced skiers. Pride of Tsakhkadzor is a modern cable car LEITNER, including three consecutive lifts with a total length of 4200 m. to climb from the lower level to the top takes only 40 minutes. Besides the tramway, the ski area has two ski lifts and a few ski lifts. The route is not lit, so the lifts are open from 9:00 to dusk. The cost of rental equipment: complete skier (skis, boots, poles) — 5000 AMD a day, set a snowboarder (snowboard, boots) — 7000 AMD, glasses — 2000 AMD, helmet — 2000 AMD. Guided excursion — 10 000-15 000 AMDper hour. In the southern part of the resort is the Main sports complex of Tsaghkadzor (web site), built in the 1960s to prepare Soviet athletes for the Summer Olympic games-68 in Mexico city. In 2007 completed its full renovation and now it is quite a modern town centre with comfortable hotels, new gym equipment, sports halls, a sauna and an indoor Olympic swimming pool. A single ticket for the lift is 2000 AMD. It makes sense to buy a ski pass in the form of a personal plastic card cost 2000 AMD. Before using it you must put a certain amount: 10 000 AMD 1 day in Catania, 29 000 AMD 3 days, 47 000 AMD 5 days and 60 000 AMD per week. Skating for children younger than 10 years worth of 9000/24 000/35 000 AMD for 1/3/5 days. «Shelf life» ski-pass — 5 years, during this time, it is sufficient to replenish it as needed. The main time of the year in Tsakhkadzor — winter, which accounts for the peak tourist season. In this period is mild, moderately cold weather with lots of Sunny days and low precipitation. The thickness of the snow cover in winter reaches 1.5-2 m. Good conditions for skiing are saved to the middle, and sometimes even before the end of March. May and June, despite the cool air and frequent rains, lush flowering Alpine meadows. From July to September is warm and clear weather, favourable for measured rest on the nature, picnics and long walks or Cycling.